Wii U missed both 777 and 999 by a single unit. Sad. One could argue that Pokémon X and Y had been out for 4 weeks longer than Sun and Moon at this point, and had sold more, so it's understandable why it is perforiming worse at the same point of the year. For now my prediction PS4 will peak this year in Japan looks accurate. Why is the other PS3/PS4 chart different - I thought both were based on MC data? PSPro seems like it already outsold all the other failed revisions including the PSX, I guess it still needs saving until it hits XB360 sales in Japan though? Gravity Queen! Get to 100K! PS4 is looking steady. FFXV dropped big time in Japan and yet it more than made up for that abroad. It was profitable on day one. We don't know if RE7 will have that same level of success WW but I don't think Japan is as relevant as you're suggesting. Also, RE6 came out in 2012 with substantially different circumstances. FF already shipped abour as many copies as previous entries. RE7 shiped 2.5mil say one, RE6 shipped 4. RE isnt making up the Japanese decline. Anybody expecting RE7 to have RE6 sales after what RE6 did to the franchise is being too optimistic... a big drop in sales was expected after RE6 reception. Sarcasm was obvious I think. Next we have to deal with Switch that has zero hype even at launch. So Vakyria Azure is around 75-80k, LTD with digital it will probably end up above 100k which is more or less what Shining Resonance did before. Now the only downside I can see is if they really get bad press for the title and it hurts the franchise, Internet might be very vocal about it but even if it happens if the following project is a proper game heavily tied to Vakyria Chronicles then I can't see why it wouldn't sell anyway regardless of Azure's reception. People love blaming RE6 but it makes little sense when you consider how much both the original release and the recent HD remaster have sold. What they should be blaming is RE7. Anyone who expected the game to perform well in Japan after shifting focus to first person and the western audience (and rebooting the story with a new cast) is nuts. I used MC numbers for both... I guess the chart uses Famitsu. RE7 is doing less than I thought it would. I expected less than RE6, but less than half? Nope. Maybe horror games really aren't a good idea. It was... the sales was high at launch but I believe most people dropped the game and avoided RE7 because RE6. Even the remaster just did 35k until now. This i agree with FF is seeing growth WW and bringing in extra money with DLC , season pass etc etc . For FFXVI they can try and win back some more Japanese sales . RE lost sales in Japan but don't seem to be making up WW or with download content for extra cash . Nice to see Danganronpa having decent legs. Now if only NISA would announce a release date already. Yeah, that's what I think too. I skipped RE7 because I dislike the changes Capcom made to it. The remaster was initially a digital only release and just got a physical version recently. And RE6 is the best selling among the 3 titles. Fire Emblem Heroes managed to surpass Monster Strike today and get up to #2 on the Top Grossing charts in Japan. If it gets to number one, that would be one of the most successful launches in ages. I actually can't remember the last time a new mobile game did this that quickly prior to Pokemon Go. what game is #1? It's not PAD, is it? Dragon Ball Z: Dokkan Battle. That game was a slow but steady climb into being a gigantic hit. Namco has been on fire lately in mobile in general. Remaster is sitting at 750k WW though. That ties into my second statement. Expectations obviously aren't the same. I agree, Resident Evil 8 will benefit from the strong reception of 7, it got people excited for Resident Evil again. As opposed to 6 which made people not want to bother with the series anymore. You mean losing sales in all markets right? When is this fan fiction about RE7 reinvigorating the series after Re6 going to end? It is the next mainline entry after the second best selling title in the series. It is going to see a significant drop. What interest did it reinvigorate? It sure as hell wasn't sales interest. When is this fan fiction about RE7 reinvigorating the series after Re6 going to end? It is the next mainline entry after the second best selling titles that isgoing to see a significant drop. What interest did it reinvigorate? It sure as hell wasn't sales interest. Thanks for the chart. 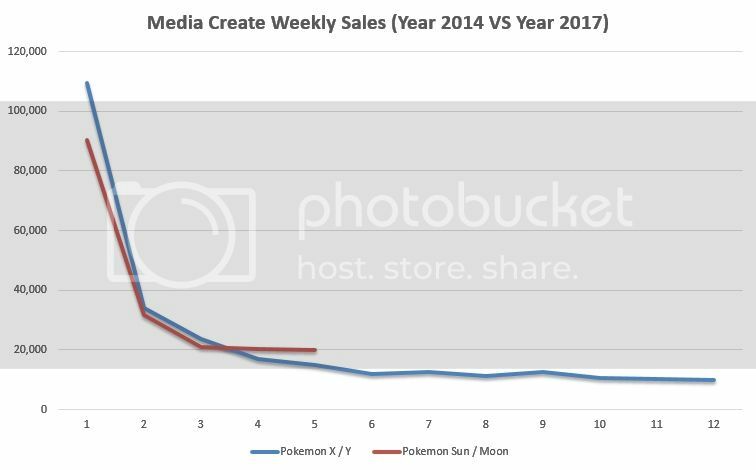 Hopefully sales remain above XY sales for as long as possible. There's the first Great Hero Battle that starts on Friday (special event), so that could happen then. Wish the numbers for RE7 were higher. Game is incredible! We see stuff like this all the time. Big AAA gets huge marketing campaign, sells lots of copies despite being bad, then the next game in the series suffers for it. Ubisoft has been the victim of this each of the last two years. What type of daily revenue are we talking about in Japan for the top mobile spots? I obviously varies, but is it typically $1mil+ or more than that? Until RE8 comes out how can you even kind of imply this is the case? Not to change this to western game sales but WD1 to WD2 has nothing to do with damaged brand imo and everythimg to do with the fact that WD1 launched with zero competition on the next gen market where as WD2 faced significant competition in a packed holiday season. As of now I consider RE7 being some return to form huge reinvigoration of the series a fan fiction. There is literally no proof RE6 killed the franchise. The only proof we have is the game was critically panned but sold millions. Then got remastered this gen and sold hundreds of thousands more units. That is literally it. I'm not even hating on RE7. I just can't grasp the narative being pushed. Remember you are predicting for the entire year. Multiplatform entries are the combined available sales of each platform described. No, it's just blame shifting in this case. The two best selling games in the series (and for Capcom overall) are RE5 and RE6. RE7 has very little in common with them. It's the new formula screwing up, not the old. Yep. A new Chronicles game won't be affected by Azure's performance. And Azure got people's attention. But I'm sorry to say, if Azure is the best they can do, then I'm not hopeful for a quality Chronicles title from what I've played so far. Historically the top spot was $2-$4+ million and the top 4 or so were generally $1+ million, but the market has grown, especially at the top, so it could be higher there. It's actually not implausible that Fire Emblem Heroes becomes the highest grossing (and trivially the most profitable given mobile margins) game in the series history by the end of the month, especially since it's also charting pretty well in other regions. How has the Xbone version done in comparison to the Xbox 360 version of Resident Evil 6 though? PS4 has a much bigger marketshare than PS3 did. Both did less than 100k because there is no award for them. I'm pretty sure PS3 user base in 2012 was way bigger than actual userbase of PS4 in Germany. Maybe but probably not by much, Ps3 sold around 5M on Germany, Ps4 is probably at 4 million now. G: Is there any possibility for Final Fantasy XV to be released on Nintendo Switch? G: It wouldnt run at all? But we havent conducted the proper tests on whether it would run properly on Switch or not, so I cannot say for sure. G: So there is no plan at all? HT: There are no plans for Switch at the moment, but overall, there is interest in the platform among the development team. We do have lots of Nintendo fans inside BD2. The difference between FF XV and every other PS 4 game is crazy. What games are Japanese players using their PS4 for ???? Presumably they're buying it for a couple of games they want and then playing games elsewhere most of the time, or doing some other kind of activity. That's my only concern with Valkyria Azure is how it would hurt the brand. I feel though if Sega can easily communicate it's not the same but entirely independent from the mainline it's damage would be relatively minor. yea not sure why people thought this was a possibility. Never seemed likely from the outset. Then when FF7 was called first on PS4, there was speculation. But that might just be an Xbox version months later.